Below is a set of slides from a presentation on April 9, 2018, by dairy economists from Cornell & University of Wisconsin. In sum, the recent legislative updates to the Margin Protection Program (MPP) have trickled down to the Farm Service Agency who administers this program. The updated MPP Decision Tool will be available later this week at https://DairyMarkets.org/MPP/Tool/. Any producers who enrolled for 2018 and who bought up coverage will be refunded premium payments and allow to re-enroll. “Tier 1” volume is up from 4 to 5 million pounds of annual historic production. Indemnity calculations are now based on monthly values, rather than 2-month average values. Premiums for Tier 1 coverage are significantly less than before; premiums for production history over 5 million pounds have not changed. MPP and LGM coverage is still not allowable for the same period. For producers who enroll more than 5 million lbs, the coverage level for Tier 1 and Tier 2 milk must be the same. For producers with production history above 5 million pounds, cover as close to 5 million lbs as possible; this strategy will work this year for less than 30 millions pounds of production history (approx. 1200 cows). Dr. Jack Britt presented “The Dairy Industry in 2068” at the NC Dairy Conference in February 2018. 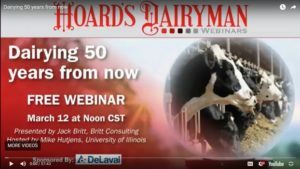 His presentation is recorded as a Hoards Dairyman webinar at the following link: Dairying 50 Years from Now.